I refer to this MPML message and to the associated conversation, in particular to the interesting comments made by Aldo Vitagliano, author of Solex orbit simulator, about the difficulty to see a cluster of KBOs. I do not know the answer but this prompted me to look at the KBO's orbit parameter distribution. What follows next is an exercise ... so I do not claim that it is correct! 1) I scaled the above table so that every column has mean 0 and variance 1. 2) I calculated the distance between any two rows (manhattan distance). 3) I submitted the scaled table to the function hclust choosing clustering method complete. 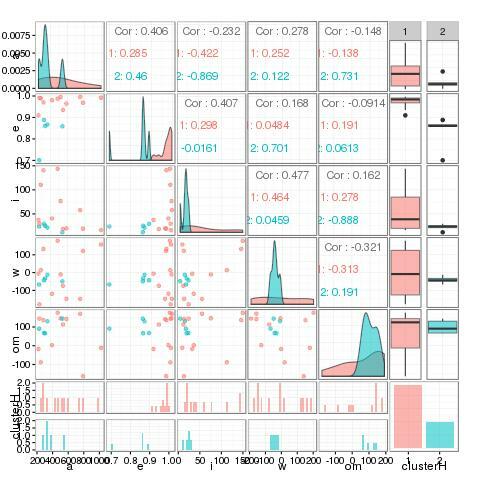 4) I used a further R function ( see rect.hclust ) to display colored rectangles at different height: the purpose is to help visualize the various clusters at different levels. I do not know, whether these clusters have a statistical significance or not. 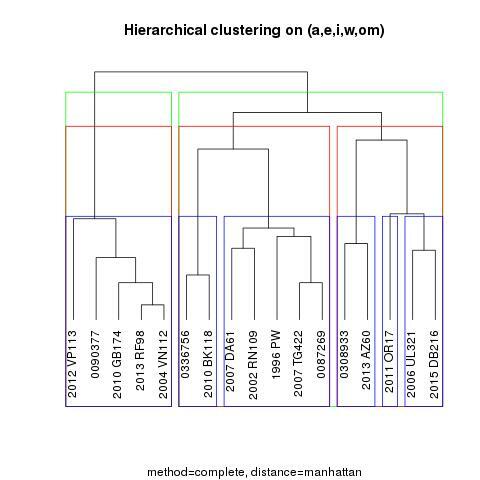 The left cluster maybe interesting: in fact, it consistently maintains its shape even when you cut the dendogram at a level where the second big cluster gets split into 5 subgroups. 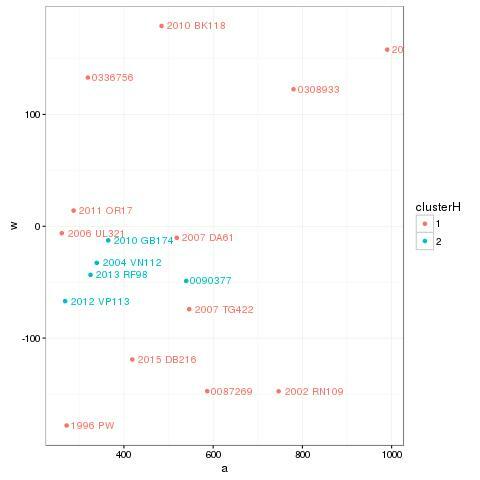 The left cluster contains asteroid 2012 VP113 plus other 4 even more similar asteroids. From now on I will refer to this cluster as "cluster 2" as opposed to "cluster1" made by all other KBOs without further distinctions. in the diagonal, you can see the density distribution, each cluster being given a different color. Cluster 2 is coloured in blue. above the diagonal: you can see the correlation between pairs of parameters, with cluster detail and total as well. below the diagonal: you can see a scatter plot diagram of each pair of parameters, again the colour represents a cluster. 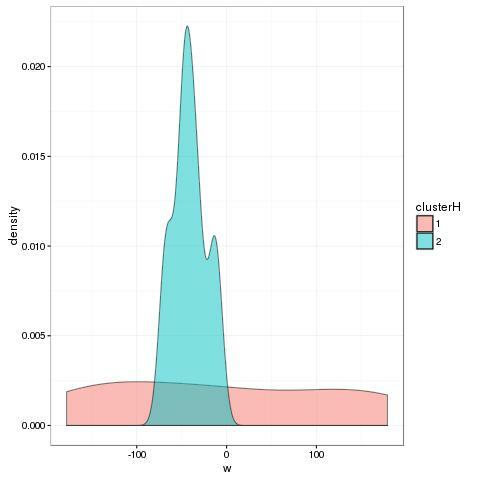 .... and, if you are interested in a specifc plot, you can make it alone with the ggplot function.